The best way to get the biggest benefit from NAWBO is to get involved. Committees with volunteer members are responsible for the daily operations and the ongoing value of the organization. Joining a committee doesn’t have to be a big commitment. We welcome all levels of participation and there are opportunities for every interest and skill set. The one thing they all have in common, is that it is the fastest and most effective way to get to know the other members of NAWBO. 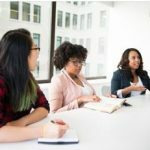 Want to join a NAWBO Columbus Committee? Complete the interest form below and Arien Lawless, NAWBO Cbus Membership Coordinator will be in touch! The communications committee is responsible for all marketing activities regarding NAWBO. They create, distribute, maintain on-going public relations, and provide all aspects of general marketing for all events and resources. The Communications Committee is currently looking for members who like to spread the word! The Corporate Partners committee is responsible for representing our chapter to solicit financial and in-kind support from major corporations and organizations in the Central Ohio area. The programming committee plans and executes all NAWBO Columbus chapter events. These events include monthly meetings, Candid Conversations, Mix & Mingles, and Visionary Awards Luncheon. The Programming Committee helps with finding speaks, securing venues and securing the programming schedule. Want to make a difference? Join the Public Policy Committee in our mission to make our State Legislators aware of the POWER OF NAWBO! Be prepared to work hard to provide the membership with the tools they need to influence their Representatives to support issues the affect women-business owners. The Roundtables committee helps members maneuver the roundtable selection process and agenda. The Membership committee heads up creative efforts to grow membership, enrich member experience, and reach current members to keep them involved in ways that offer business value. This committee is looking for several volunteers who can spend a little time sharing the benefits of NAWBO with potential members through phone calls or targeted events; This is a highly flexible job, but an excellent way to ramp up your NAWBO networking. 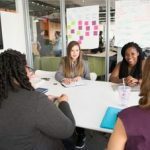 The role of the NAWBO Columbus Diversity and Inclusion committee member is to serve as an ambassador with intention and to promote our mission and values to all of those we encounter in the business community. We will build an inclusive environment by providing resources and training and also welcoming all thoughts and opinions. The committee member will commit to developing, coordinating and supporting various initiatives that enhance and support our goals.